When I was very young there was a radio programme called “Listen with Mother”. We didn’t have a television, and I listened to this nearly every day (with my Mum, of course). Without fail, the show began with “Are you sitting comfortably? Then I’ll begin.” (I’m not sure whether it’s a positive or a negative that this is etched in some recess of my brain). These days, with the increasing number of studies suggesting that sitting is bad for us, it seems to be a particularly interesting question. The answer may well be “Hell, yes!” (“I’ve got this fantastic well stuffed, reclining, cocooning, i-pod docking super-sofa and I’m as comfortable as anyone ever has been.”) Of course sitting is comfortable, or certainly can be. And, it turns out, it shortens your life, makes you fat, possibly metabolically deranged, possibly pre-diabetic – never mind the possible reduction in range of hip movement. However, I’d like to leave the bulk of the anti-sitting stuff aside, valid as it is. It seems to be getting a reasonable amount of attention. Instead, I’d like to concentrate on the “comfort” part of the equation. A little while ago I saw a Tweet from @NocturnalOutpos: “Our lust for comfort is the biggest thief in our lives…”, which resonated for me. I think there can be no doubt that the technological advances that have given us easier access to greater comfort have also weakened us as a species, or at the very least made us less resilient (Nassem Nicholas Taleb would say ‘more fragile’). (Back to) sitting = more hip dysfunction & back/knee problems, for example. Controlling every aspect of our living environment makes us less well able to cope with the unpredictable. Can we survive without electricity and telecommunications. Most end-of-the-world disaster movies that I’ve seen assume that we can’t (at the same population level). Evolutionary psychologist Satoshi Kanazawa writes: “All living organisms in nature, including humans, are evolutionarily designed to reproduce. Reproductive success is the ultimate end [goal] of all biological existence.” So, yes, having children is pretty much our reason for existing as a species. The hunter-gatherer existence of our pre-agricultural ancestors would have had its own pragmatic population controls. It is simply not practical to live that semi-nomadic life with lots of children tagging along, and the food supply would have been a limiting factor. When the agricultural revolution came along things became more comfortable, in that it was possible to stay in the same place, procuring food was no longer everyone’s task, and food became more abundant (though less nutritious). Consequently it was possible for the human population to explode – all the natural population constraints of the HG existence were lifted. Terrific. As a result we now enjoy all the fruits of civilisation, both positive and negative. Negative in that our numbers, ingenuity and technology have allowed us to overcome or resist many of (what I perceive to be) Nature’s attempts to maintain some balance by keeping our numbers in check. I’m writing this sitting in a cafe on a Saturday morning, as it fills up with people, especially families. It’s noticeable how many couples have several children, clearly born in relatively quick succession, and the part of me that is certain that there are already far too many of us on the planet can’t help inwardly asking ‘Why?’ Why are you having all these children? (In this instance ‘all these’ denoting more than two). And the answer that I come back to is, we are too comfortable. It’s too easy to procure food, shelter, water and energy, so we trick ourselves into thinking that what may be sustainable in at a local, insular level is equally sustainable for humanity as a whole. On a less ‘end-of-the-world’ note, it’s common to talk of one’s ‘comfort zone’ these days. 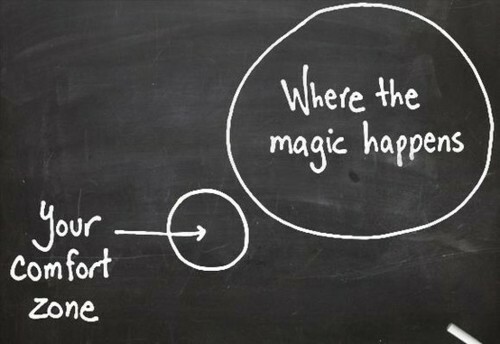 It’s not an unusual idea that we need to leave our comfort zone to make changes, or to achieve more. Being uncomfortable thus is the route to progress, perhaps success, or becoming stronger. And the inverse is true. Comfort makes us weaker. Comfort encourages stasis. Comfort anaesthetises. I’ll still be sitting comfortably on the sofa for a while this evening, but more fool me if I do so for long. 3 responses to Are you sitting comfortably? Good & interesting blog Mike and I have to agree we are too comfortable. On the comfort note and hip dysfunction – I recently started having some hip problems, nothing serious I discovered (after seeing a physio). I then happened along a programme ‘Trust me I’m a doctor’ and after watching it, I decided that I would stand a lot more. Usually I would be sitting down to type this but not anymore, and I have to say that my hips have improved considerably.